Gwindel: Mineral information, data and localities. From German "Gwindel", meaning "gewunden" = contorted, twisted, wound. Pronounced "gvin-dell". - right-handed gwindels twist clockwise. - left-handed gwindels twist counter-clockwise. In most gwindels the handedness can easily be determined by the position of the trapezohedral "x"-faces. Gwindels are found in alpine-type fissures and are always accompanied by macromosaic quartz of normal habit. 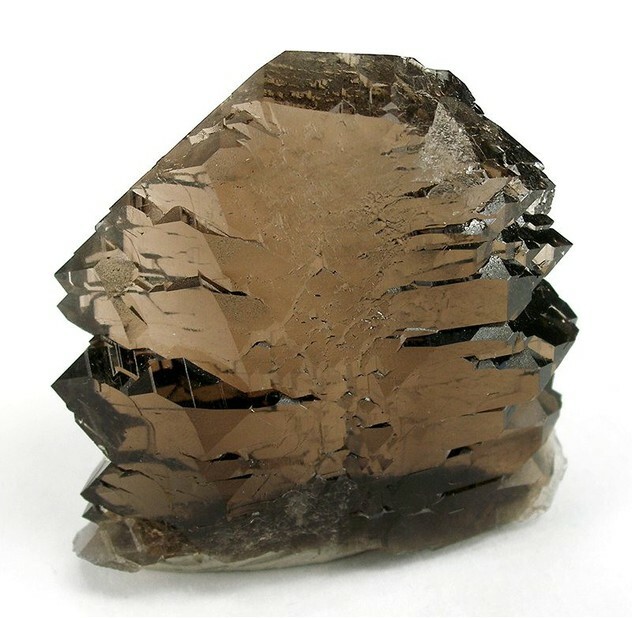 They are often smoky, rock crystal gwindels are less common. The structural base of the twist has just recently been discovered: A high number of straight screw dislocations cause a uniform so-called Eshelby twist (Cordier and Heidelbach, 2013; Eshelby, 1953) that is typical for slow growing crystals. This slow growth is in line with the occurrence of gwindels in certain alpine-type fissures. 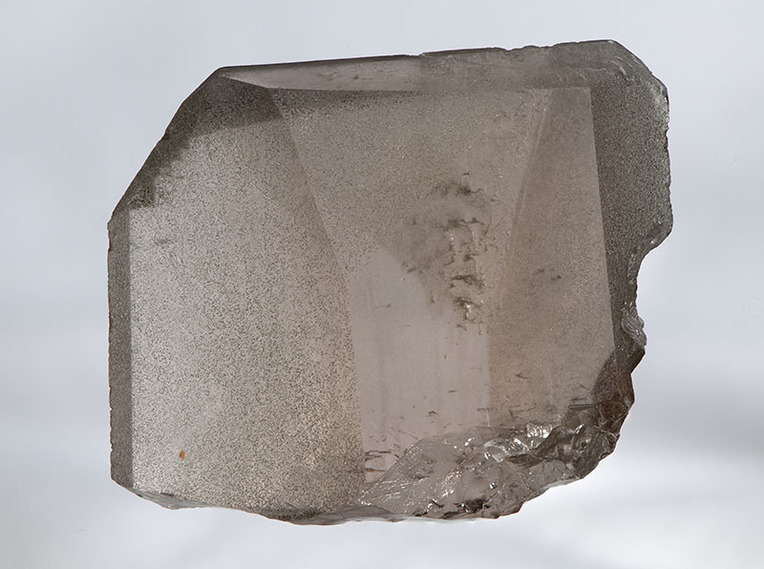 Because of the often multiple tips and the strong development of sutures on the crystal surface, gwindels are often described as lateral stacks of quartz crystals. This is not correct: each gwindel starts as a single crystal, and only the overgrowth with quartz of a macromosaic structure causes the impression of a composite specimen (Kuzmina et al, 1987; Dolino and Bastie, 2009). Note: Gwindel-type growth is also known for other minerals. Chlorite Group 2 photos of Gwindel associated with Chlorite Group on mindat.org. Smoky Quartz 1 photo of Gwindel associated with Smoky Quartz on mindat.org. Adularia 1 photo of Gwindel associated with Adularia on mindat.org. Quartz 1 photo of Gwindel associated with Quartz on mindat.org. Tschermak, G. (1894) Über gewündene Bergkrystalle. Denkschrift der Akademie der Wissenschaften, Mathematisch-Naturwissenschaftliche Classe: 61: 365-400. Eshelby, J.D. (1953) Screw dislocations in thin rods. Journal of Applied Physics: 24: 176-179. Kuzmina, M.A., Punin, Y.O, Kamentsev, I.E. (1987) Diagnostic features of the external and internal morphology of the screwed quartz crystals. Proceedings of the Russian Mineralogical Society: 116: 445-453. Žorž, M. (1994) Pyroelectrically caused twisting of quartz crystals. In Geologija: 35th book: 183-206. Moore, T.P. (2007) Alpine quartz gwindels. Mineralogical Record: 38: 103-121. Dolino, G., Bastie, P. (2009) X-ray study of twisted natural quartz (gwindels). ESRF Report, MA-507, Laboratoire de Spectrometrie Physique, Universite Joseph Fourier, Grenoble. Žorž, M. (2009) Quarz-Gwindel. Mineralien-Welt: 20(3): 30-46. Cordier, P., Heidelbach, F. (2013) Origin of twist in "gwindel" quartz crystals from the Alps: a transmission electron microscopy study. European Journal of Mineralogy: 25: 145-153. The following Gwindel specimens are currently listed for sale on minfind.com. Niedermayr, G. & Schnaitmann, E. A. (2010): Neuigkeiten aus Namiba. 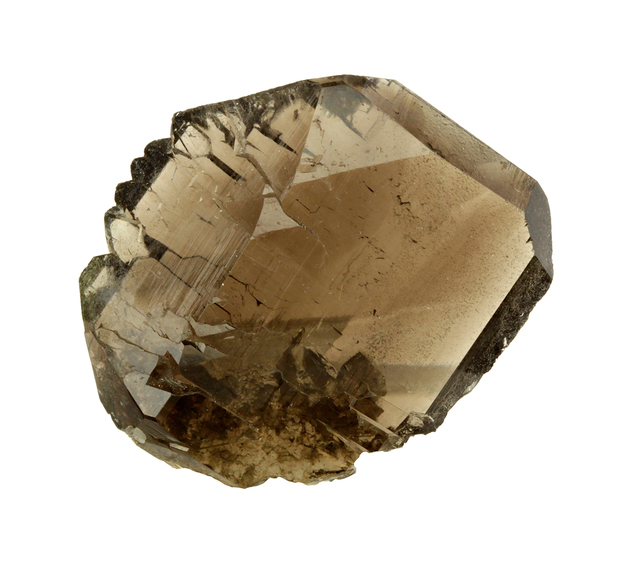 Mineralien-Welt 21 (6), 89-96. Teige, B., Willener, A. (1997) Die Gwindelkluft an der Oberaar (BE) oder wenn Strahler strahlen. Schweizer Strahler, 10(11).